Hawaii residents pay more in income taxes in part because of higher spending on education compared with the national average, but also because of larger per capita state government costs and borrowing, a Census report shows. Still, when compared with other states, Hawaii dropped to 10th in the nation from seventh in revenue collection per person and to sixth from fifth in spending from 2003 to 2004, according to yesterday's Census Bureau report on state expenditures and revenues. The drop occurred even though the state saw a $1.4 billion increase in revenue in 2004, largely due to a change in the way health insurance is collected from state employees. 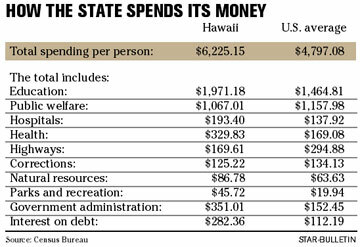 Hawaii is usually among the top 10 states in per-capita spending and revenues in the annual report. Alaska, because of its oil tax revenues and payouts, normally tops the list in both spending and revenue. Because the state pays education costs, Hawaii is also skewed higher in both revenue and spending when compared with other states where counties help fund the cost of education, said state tax director Kurt Kawafuchi. "I know people don't see it because the (property) values are so high, but Hawaii has relatively low real property tax rates," Kawafuchi added. The state collected an estimated $6,520.81 per person in total revenues in 2004. State taxes account for a little less than half of that amount. Tax revenues increased about 8 percent, to $3,050.03 per person, in 2004 from $2,858.15 in 2003. Hawaii's personal income tax burden came to about $926.47 per person, $95.52 per person higher than 2003. Hawaii's income tax is also about 37 percent higher than the U.S. average. Kawafuchi said that is one reason the governor is pushing an income tax cut. About half of the tax revenue in 2004 came from the general excise tax, which brought in $1,505.85 per person, more than double the U.S. average for sales taxes. State economist Pearl Imada Iboshi said per-capita sales tax revenues are much higher in Hawaii, but that is offset by the money contributed by tourists who pay the general excise tax whenever they buy anything here. Other taxes here, including corporate taxes and licensing fees, are much lower than the U.S. average. The state's other income includes money from federal and local governments ($1,299.42 per person), miscellaneous revenue ($241.08) and the market value of the state's health and retirement funds ($1,231.21). That category known as insurance trust revenue more than tripled from 2003 to 2004, largely due to a health insurance change that shifted state worker health coverage from separate union plans to a single state health system. When it comes to spending, the largest expenditure is on education -- about $1,971.18 per person, about 32 percent of the state's total spending and about 35 percent more money than the U.S. average. The cost of government came to $351.01 per person, about 130 percent higher than the U.S. average in 2004. But it was also lower than in 2003, when state government cost $377.24 per person. The state's debt payments equaled $282.36 per person, about 150 percent higher than the national average. The state's total debt at the end of the 2004 fiscal year was $4,553.24 per person, about 78 percent higher than the national average of $2,560.23, although it is unclear how much of the debt is related to spending on school buildings.